The last two trophies Simona Halep hoisted came in Canada last week and the French Open in June. Both triumphs coincided with Rafael Nadal’s successes at those two tournaments. Halep’s coach Darren Cahill has a good reason to find that particularly amusing. “Rafa has inspired her [Simona] with what he’s been able to do, with the way he trains, with his work ethic, the way he fights for every single match no matter what the score is. He can be down 6-0, 5-0, 40/0. You wouldn’t even be able to tell with him,” Cahill told reporters in Cincinnati on Tuesday. “That, to me, is what she’s modelled the last year and a half on. I think you see a little bit – no one’s going to be like Rafa. But you see a little bit of the old Simona compared to the new Simona, and she’s more like that, because she’s always had a great work ethic. I have never had to push her on the practice court. She always gives 100 per cent. “She’s like a little Rafa on the practice court. We need to make her a little Rafa on the match court, as well. For someone who wears her heart on her sleeve, witnessing Halep’s mental transformation over the past two years has been remarkable. She went from losing a heartbreaking French Open final to Jelena Ostapenko after blowing a significant lead 14 months ago, to claiming the title in Paris for her maiden Grand Slam triumph a year later. She credits Cahill for helping her change her on-court attitude and her sports psychologist for improving her mental strength. Now ranked No. 1 in the world and fresh off of a trophy run in Montreal, Halep insists she is hungry for more ahead of the kick-off of her Cincinnati campaign on Wednesday against Ajla Tomljanovic. “No time for celebration but at the end of the year I will for sure for everything that I’ve done this year. It’s not easy, it’s tough. And I expect a really tough one in my first match here. I’m not fresh, but I’m confident. So I think the balance is okay,” said the Romanian on Monday. Halep hit a rough patch with Cahill during the spring of 2017 and he briefly ended their coaching relationship because of her negative attitude on the court. They reunited shortly after and she’s gone from strength to strength ever since, becoming world No. 1 and winning a first major title. She believes she wouldn’t have achieved any of that had it not been for that tough love she received from Cahill when he decided to split. “I think I have to give him the credit for that, changing my attitude and being more positive on court and also off court. Of course that was maybe the toughest moment of my career, losing my coach because of my attitude and not because I’m not working,” confessed Halep. Cahill, who formerly worked with Andre Agassi and Lleyton Hewitt, joked when he was told what Halep said regarding the impact of that break last year. “She said that? Oh, can I get a tape of that,” laughed the Aussie coach. He believes the biggest improvement with Halep has been her self-understanding and says him stepping away last season was not strategic but a genuine attempt at helping her find her way. “‘Tactic’ is probably not the right word. I think ‘last resort’, a little bit, because we’d worked through a series of structures to try to help her get better on the court, and she was still getting in the way of herself,” he explained. “So I didn’t know if that was me being the roadblock or whether it was more her. “It was either basically problem with me and she needed to hear a new voice, and the last thing any coach wants to do is hold a player back. I was having these internal discussions with myself as to, okay, maybe she does need a new voice, or maybe she needs a sparkplug moment where it might be a bit of a wakeup call for her to really look inside herself, try to get better, and get the most out of herself. “She had to go away for three, four, five weeks, decide what she needed to do. I know she’s never going to be perfect on the court, and I don’t want her to be, because she’s got this Romanian blood, which is fire in the belly, which is fun, exciting, emotional. You want that in your players, because it’s part of the reason why she’s so good. “But there has to be a balance, a line, and we weren’t finding that balance. She’s worked really hard over the last year and a half to find that balance. She’s not perfect, but she’s getting better all the time. But more than anything, she understands herself a lot better now. She never used to do that. She would walk off the court and go, ‘What’s the problem?’ Then you’d sort of sit down and walk through the match. In the 2017 French Open final, Halep was up 6-4, 3-0 against an unseeded Ostapenko then saw the match slip away. A year later, she rallied from a set down to overcome Stephens and took the title. “I feel different, I feel stronger mentally and I enjoy more. Even after the French Open, it was a big success and my dream came true, I still feel good on court and I can say that I’m relaxed and I enjoy more,” insists Halep. After losing in the third round at Wimbledon, squandering a match point along the way, against Hsieh Su-Wei last month, Halep described her own performance as unprofessional. She took three weeks off then came back to the circuit and immediately won the Rogers Cup in Montreal. Her faith in her own abilities now helps her rebound from any setback in impressive fashion. She also paid tribute to her sports psychologist for the work they’ve put in. “She’s turning me to the positive way. She makes me feel like I’m able to change some personal things and I was able to do that. And I think also the team, the people around me, they always pushed me to pass my limit, which is great and maybe that’s why I was able to change. “I’m not perfect. I still have [things to work on],” she adds with a smile. That may be true. But Halep and Cahill both know she’s come a long way and the world No. 1 sounds adamant about extending her stay at the top. Wawrinka and Azarenka have had interrupted seasons. 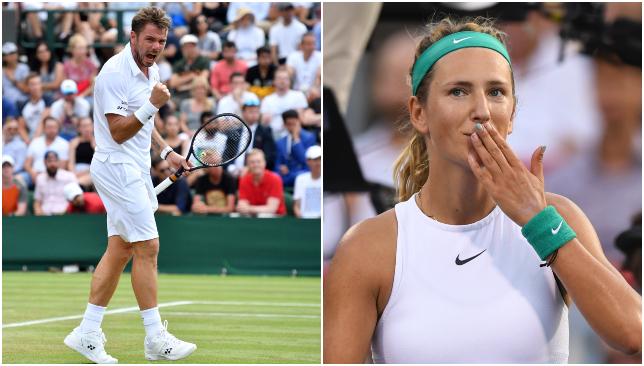 Former grand slam champions Stan Wawrinka and Victoria Azarenka have been awarded wild cards into this year’s US Open. Wawrinka, who won his third slam title at Flushing Meadows two years ago, has found life difficult since coming back from knee surgery in January and missed out on automatic entry with his ranking down at 151. Azarenka returned to the tour last summer after having her first child but a custody battle with the father of her toddler son Leo left her unable to take him outside America and she did not play a tournament between Wimbledon last year and Indian Wells in March. The Belarusian, twice an Australian Open champion, has been unable to reach her previous heights and was also ranked outside the cut-off for the year’s final grand slam, although she has since climbed back inside the top 100. Russian veteran Svetlana Kuznetsova, the champion in New York 14 years ago, has also been given a wild card. Andy Murray’s US Open preparations were cut short on Monday as he suffered an opening round exit in Cincinnati to Frenchman Lucas Pouille but the Brit remains positive as he looks ahead to his first Grand Slam in over a year. Just seven matches into his comeback from hip surgery, Murray rued a poor first-set performance in his 6-1, 1-6, 6-4 loss against Pouille. “Today’s start of the match was not good at all. It was a pretty bad first set, and then after that, got a little bit better. Managed to hang in a little bit in the second set. I lost the first service game. I was 40-15 up and was quite a long game, that one. And then had a few little chances on his serve as the set went on but wasn’t able to take them,” explained Murray, who had never a lost a set to Pouille in any of their four previous meetings. Murray has won just four matches since his return to action in June and is still in the early stages of his comeback. The 31-year-old, now ranked 375 in the world, is getting ready to compete in his first major since Wimbledon last year and is still unsure how his body will react to best-of-five play. “I kind of need to see once I’m in that position. I have played, four three-set matches and a couple long ones in Washington. Although I didn’t feel great, I managed to get through them,” said Murray, who reached the quarter-finals in DC before deciding to withdraw from the tournament to take care of his body. Murray spent five days off the tennis court after Washington to focus on rehab and fitness work and admits the stop-and-start is currently affecting his consistency. He isn’t too discouraged by the three losses he has suffered so far this season, acknowledging they came against quality opponents. “It has been hard. And also some of the matches that I lost, as well, like today, although it wasn’t the best tennis match – it didn’t feel like I played a good first set at all – I only lost four more points in the match than him. 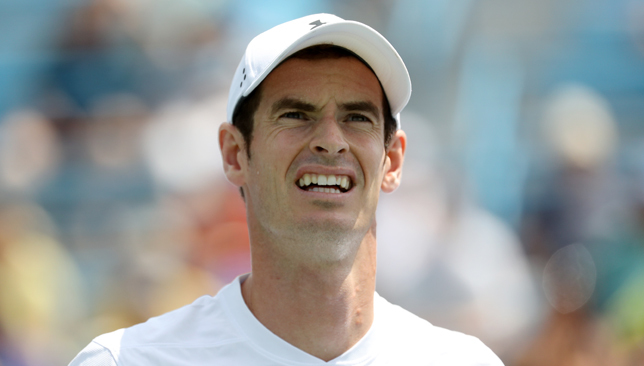 It was tight,” said Murray of his performance against Pouille. “He’s a top-20 player. I lost against Nick [Kyrgios in Queens] , and that was another really close match, as well. So although, obviously I would have liked the results to have been a bit better, matches and the guys I have lost against have been three top-20 players and wasn’t far off winning two of those matches. So there has been some positives there. Meanwhile, another player on the comeback trail from surgery, Stan Wawrinka, claimed a confidence-boosting 6-2, 4-6, 6-3 victory over No. 12 seed Diego Schwartzman in the Cincinnati first round on Monday. Never gets old… Another breathtaking backhand from Stan the Man. The Swiss three-time Grand Slam champion, who had double-knee surgery a year ago, won back-to-back matches for the first time since February last week in Toronto en route to the last-16, where he fell in two close sets to Rafael Nadal. He is 9-12 win-loss this season and next faces Kei Nishikori in round two in Mason, Ohio. “Those are the kind of matches that I’m looking for. It’s important for my confidence. It’s important for my game. I think to beat a player like Diego, it’s not only important for confidence but it show that I’m playing well, I’m moving well. He’s in the top-20 in the world, so it’s a big win already,” said Wawrinka of his triumph over Schwartzman. Wawrinka added: “My body is, where it is right now, is I think really strong, really good, but still some up-and-downs. Still there is a lot of things that I don’t know how it will react when I’m going to play a five-set match, when I’m going to win hopefully a five-set match back-to-back, things like that, if I start to win more matches. For sure I need to get used to again to push my body to the limit, winning match after match and keep playing, keep moving my best.